"He was an old man who fished alone in a skiff in the Gulf Stream and he had gone eighty-four days now without taking a fish." 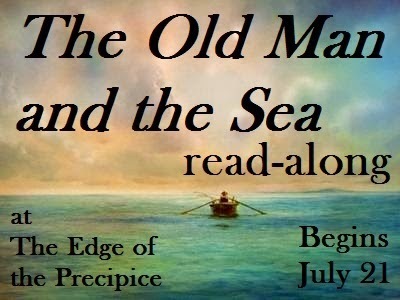 I had disliked Hemingway ever since I attempted to read The Sun Also Rises as a teenager, but when Hamlettte from The Edge of the Precipice announced her read-along of The Old Man and the Sea, I decided to give him another try. Perhaps we would get along better this time. This novella was an unexpected surprise and delight that has, well, perhaps not made me a Hemingway fan, but at least has made me very open to reading more of this works. Imagine that you live in a small town in a simple hut and your life consists daily of fishing for a catch that will bring you your wages when you sell it in the market. Now imagine going 30 days without a fish, then 40 days. You lose your only helper, a boy, because you are now viewed as unlucky, and he is sent to work with more successful fishermen. Day 60 passes but still you sail out as every other day, confident you will catch something. By the time our story begins, most men would be worn with worry and care, but not the fisherman of this story, Santiago, who prepares his boat and sets sail as he has the previous 84 days that he did not return with a catch. On this particular day, Santiago ventures into the Gulf Stream north of Cuba to set his lines and wait for his luck to change. And does it change! Hooking an enormous fish, Santiago begins his battle which lasts three days and pulls him out into the depths of the ocean, perhaps without the possibility of return. Yet return he does, but tragically his magnificent catch has been worried by sharks, and resembles nothing but a bony carcass. Does this worry the old man? Not one bit. He makes the same climb to his shack that he has made the last 84 days, yet this time he is a different man. Falling onto his bed, he dreams of lions and his youth. While Santiago is fighting against defeat in the novella, at the end of the novel, instead of being defeated by the fact his catch returned only as a ragged skeleton, he returns a hero and his dreams of youth indicate the experience has given him life and vigor that had been missing before that day. It was not the result of his struggle that mattered; it was the struggle itself and its purpose, that brought meaning back into the old fisherman's life. 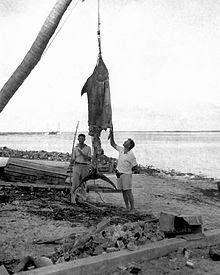 with the remaining 500 lbs of an estimated 1000 lb marlin that was half-eaten by sharks before it could be landedin the Bahamas in 1935. Some people say this story is full of symbolism, maybe even an allegory. What do you think things like the old man, the fish, and the sharks could symbolize? 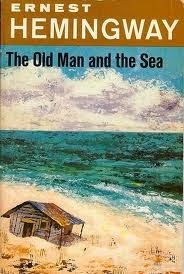 The book How To Read Literature Like a Professor states that The Old Man and the Sea is a "nearly perfect literary parable", full of Christian imagery. We encounter images of Christ in the story when, after grasping the line all night to hold the fish, Santiago made an exclamation that, as Hemingway tells us, is reminiscent of an exclamation "someone would have while having a nail passed through their hand into a piece of wood". After the completion of his voyage, Santiago stumbles up the hill, carrying his mast on his back, bringing the image of Christ carrying the cross to Golgotha, and when Santiago falls asleep in his house on his bed, are arms are spread wide, as if in the shape of a crucified Christ-figure. Were these symbols intentionally put into the story? Who can know for sure. Hemingway, himself, when questioned, said: "There isn't any symbolism. The sea is the sea. The old man is an old man. The boy is a boy and the fish is a fish. The sharks are all sharks, no better or no worse. All the symbolism that people say is sh*t. What goes beyond is what you see beyond when you know." Personally I think that Hemingway used these images to convey meaning. He didn't intend to make Santiago, Christ or a Christ-type figure, he simply used images that all readers would be familiar with, to help us feel the old man's struggle, pain, and sacrifice, and to share his triumph when he returned with the experience of the catch of his life.